Burkhard Schmitz, Claudia Plikat, and Carola Zwick began their partnership in 1992. They were looking for the freedom to work on projects that interested them. And for the freedom to do so without bosses and titles. And that's pretty much how they've operated ever since. "Everybody does everything," says Burkhard, speaking for the group that now includes Carola's brother Roland Zwick. "That's how we cultivate ideas and maintain our openness and curiosity." The group's name�Studio 7.5�comes from an early idea to rent a 7.5-ton truck, put a model shop in it, and drive from one project site to another. Obviously, freedom of movement is a big deal for these designers. They move freely�and smartly�when designing products for their clients. Going from concept stage to the model shop, sometimes within a day or two, they begin to create rough prototypes. And like kids let loose with a pile of clay, this is their favorite activity. You really have to work in three dimensions when designing products," notes Claudia. "So we don't spend much time on fancy renderings. Computer drawings just don't give you the feel, the touch, the smell." And they love designing furniture. "What's so interesting about designing furniture as opposed to, say, a tape recorder, is that the designer who designs the recorder comes in last in the chain of command," explains Roland. "It's just the beautification or 'packaging.' With furniture, it's far more holistic." They find designing Office Chairs in particular to be the most rewarding. 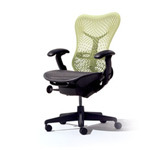 One reason is their experience working with Herman Miller on their award-winning Mirra chair and their newest design called the Setu chair. 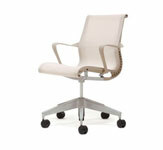 "We define not only how the chair looks but how it performs," says Carola. "We're very involved with its physical behavior, because beauty is not only what you see, it's also what you feel."